Regional Government OKs Restart Of Japanese Nuclear Plant : The Two-Way Japan shut down all of its nuclear reactors after the triple meltdown at the Fukushima Daiichi Nuclear Power Station in 2011. This plant could be the first to restart. 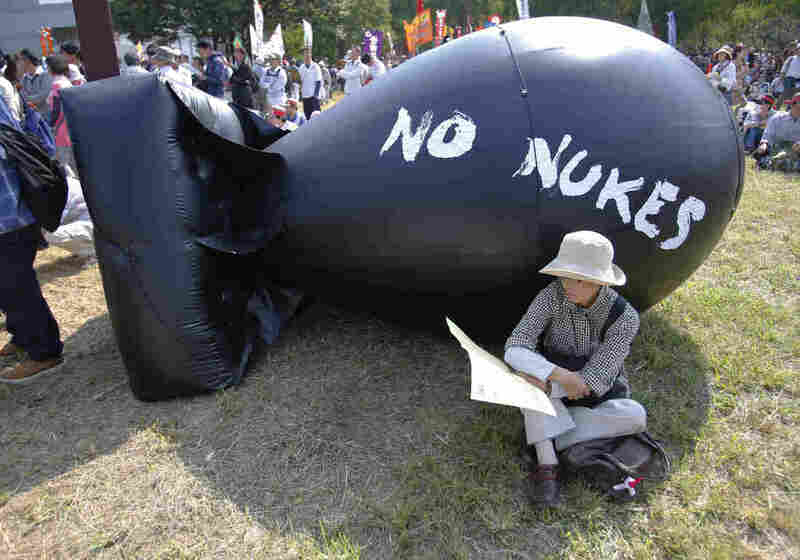 An anti-nuclear protester rests in front of bomb-shaped balloon during a rally against Japanese nuclear plants in Tokyo, back in September. Japan is one step closer to restarting its nuclear power operations, as regional authorities approved the restart of a nuclear reactor in the city of Satsuma Sendai in the Kagoshima Prefecture. Remember, Japan shut down all of its nuclear reactors after a triple meltdown at the Fukushima Daiichi Nuclear Power Station in 2011, which was triggered by a massive earthquake and tsunami. "The nuclear debate has been notable for confusion over who, ultimately, must make the decision about whether to turn reactors back on. Delays have multiplied as a result. After the regulator certified the Sendai reactors, many analysts said they could be back online in a month; now the prognosis is for early next year. "In Kagoshima, politicians have mostly been sympathetic to the industry, as have leaders in many other areas with nuclear plants. These area are often relatively poor and depend on the jobs and subsidies that come with them. "The national government, led by Prime Minister Shinzo Abe, is also openly pro-nuclear. Yet with the public still anxious about safety, leaders at all levels have sought to shift the final say elsewhere. Japanese law does not give any one elected body outright control over nuclear plants, which are operated by private companies." The Wall Street Journal reports that nuclear power is terribly unpopular among the Japanese. When lawmakers in Satsuma Sendai were discussing the matter, today, their "voices were barely audible because of booing and shouting by antinuclear protesters." "The nuclear outages have hit the local economies of cities where plants are located, and electricity prices nationwide have risen some 20% since 2011 to cope with the rising cost of imported fuel."